With respect and admiration for, if not apologies to, the late Ernie Harwell, here's something adapted from his famous Induction Day speech at the National Baseball Hall of Fame, Aug. 2, 1981, which itself was adapted from this 1955 essay. Sports video games are the very first video game, a glowing ball bouncing back across an oscilloscope in a atomic research laboratory. Tennis for Two. They're there with the first coin-operated video games, at a bar in Sunnyvale, Calif., in a crude machine stuffed with so many quarters that it broke down. Pong. That's a sports game. They are the original fighters and the original racers. Turbo and Punch-Out!! Pole Position and Ring King, Ready 2 Rumble, UFC Undisputed and Fight Night. Sports games were there at the beginning of console multiplayer gaming, on a dialup and a Dreamcast. There's a young man in Semmes, Ala. who will start a family with the million dollars he won pitching a perfect game in MLB 2K10. That's sports games. So is the Missouri alum in Denver who always beats the hated Jayhawks 100-to-nothing. 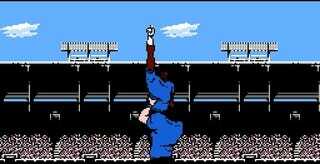 Sports games nourish the expression of a competitive spirit that, for millions, began a long starvation on their last day in shoulderpads or stirruped hose. Grown men skipping a Tuesday of work to stay home playing football all day, that's a sports game. So are the legions of sore-thumbed editors, the clutter of spent Mountain Dew bottles and Athlon magazines at their feet, working feverishly into the hot July night to rename college football rosters. The Greek rhetorician Athenaeus once wrote, "No one has yet calculated how many imaginary triumphs are celebrated by people each year to keep up their courage." I do not know either, but I suspect the answer is in the millions of sports video games sold every year the world over. Maybe sports games don't make the cover of Game Informer. Maybe their rumors aren't spread with breathless speculation. But sports games aren't announced in Los Angeles four years before they come out, and they don't release on Valve time, either. Without fail, on opening day, your favorite team, its players and the entire league will be on a disc in your tray. Sports games are speed, jumping, performance in the clutch, righthanded power and stamina. Every skill is measured, up to the coveted 99 and the rarefied 100. And you can give yourself all of them in every attribute, if you wish, in a sports game. They are the greatest performers returned to life. A child born the day Michael Jordan won his last NBA championship is now 12, and can live out the thrill of his greatest performances in a sports game. And sports games provide their own class of heroes: Jon Dowd, QB Eagles, Ken Griffey Jr., Jeremy Roenick of NHL ‘94, and the incomparable Tecmo Bo Jackson. Sports games are an old Raider on a midnight train telling some geek from the Silicon Valley that real football is played with 11 men on each side, or not at all. And they are, like the AFL and the ABA and all the great gunfighters of legend, the heroes who no longer walk among us, like MVP Baseball and the revered NFL 2K. Where our fathers and grandfathers had the Sports Illustrated jinx and the Wheaties box, today we have the Madden Curse and the cover star. Making the packshot of a sports video game is the new certification of superstar status; the first generation of athletes to grow up dreaming of such an honor takes the field now. Sports games are a wide receiver for the Denver Broncos hauling in a miracle catch and then running parallel to the goal line to bleed out the clock - because he saw that in a sports game. They're a rookie, his experience no bigger than the lump in his throat, making two debuts - one in real life, and another in the mid-season roster update. And they're a veteran too, a tired old man of thirty-five calling up Sandy Sandoval to fix his speed rating, saying he's still got his wheels. Sports games now supply their own iconic play-by-play calls: Gus Johnson going bonkers, Boomshakalaka! and TOUCH DOWN! THURMAN THOMAS. Pat Summerall exclaiming "Oh no, there's a man down!" while an ambulance snowplows the healthy bodies out of the way - that's sports games. They're Andrew Anthony, for the better part of two decades, declaring "It's in the game," a slogan that has outlived "fly the friendly skies," "be all you can be," Mr. Goodwrench and the Energizer Bunny. You may never play Pinehurst's majestic No. 2 course or rub Howard's Rock at Death Valley. You may never walk through the Shankly Gates at Anfield. The Polo Grounds and Eddie Grant's memorial are long gone. But you can go to all of these sacred places in a sports video game. And there, your favorite athlete will never leave your favorite team. There, "next year" is this year and every year. In there is the time for the Maple Leafs, the Buffalo Bills, the Chicago Cubs, the city of Cleveland - the time for England - to finally win it all. And then win it all over again. These are games for all of us. Still games for all of us, these sports games. Thank you. Happy holidays, everyone. Tape this to your locker door, get out there and play like a champion today.